We’ve been dancing all summer, what could be better! In mid-summer we enjoyed participating with many beautiful guest dancers in a show all about VEIL DANCING, called “Reflections on the Veil“. It was amazing to witness each dancer’s gift of vision. Of course we offered our own group veil improv as well. I’ve also been incorporating Tribal Veil into class and the results are good – even for beginning dancers. It gives new dancers something to hold on to, and they love watching themselves in the mirror, swooping these large pieces of fabric through the air. Who doesn’t love veil dancing? 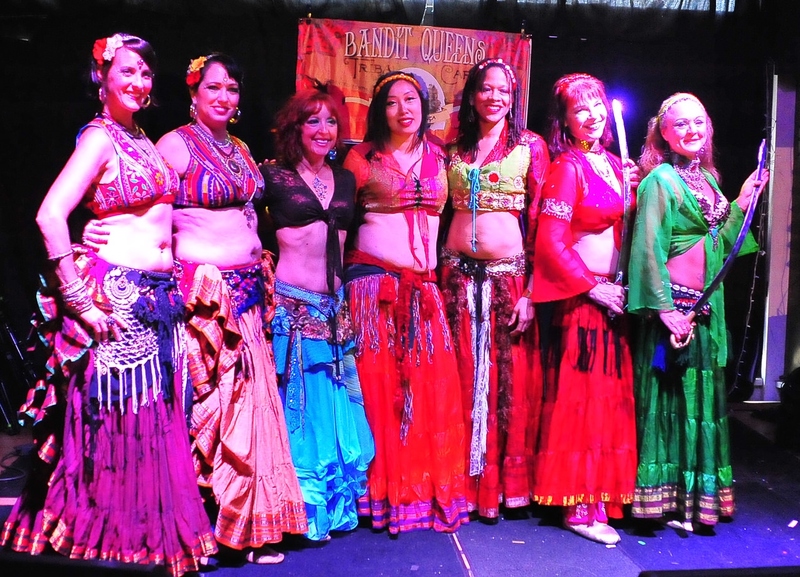 Veils are iconic for bellydancers, and they’re a great workout too. At Pennsic this year my student Siyala and I danced with Rajni and Jackie from Georgia, our dance sisters whom we see so rarely. We all were more than thrilled to have live drumming for our spot at the Middle Eastern Dance Expo; a sweet percussion band made up of our wonderful Orluk mates and guests. They were able to give us a dynamic range of tempos for our group improv set. Hooray Orluk! 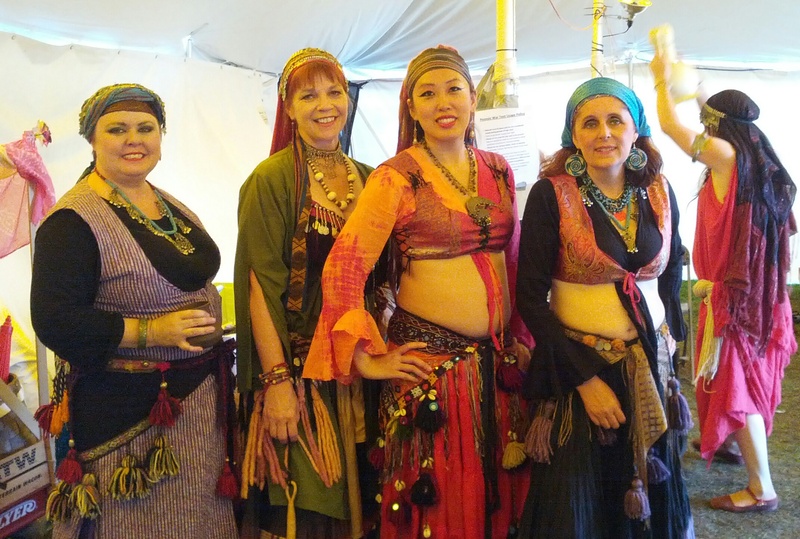 Immediately after getting back from Pennsic, we were excited to dance at Tribal Cafe in Richmond, sponsored by the Bandit Queens. We did another tempo-dynamic set that was extra fun for me because the song begins with karkabas! I’m talking about “Sahara Caravan” by the Desert Knights. Very cool! Tribal Cafe was a lot of fun for so early in the morning! I hope to do it again sometime, we met great folks. 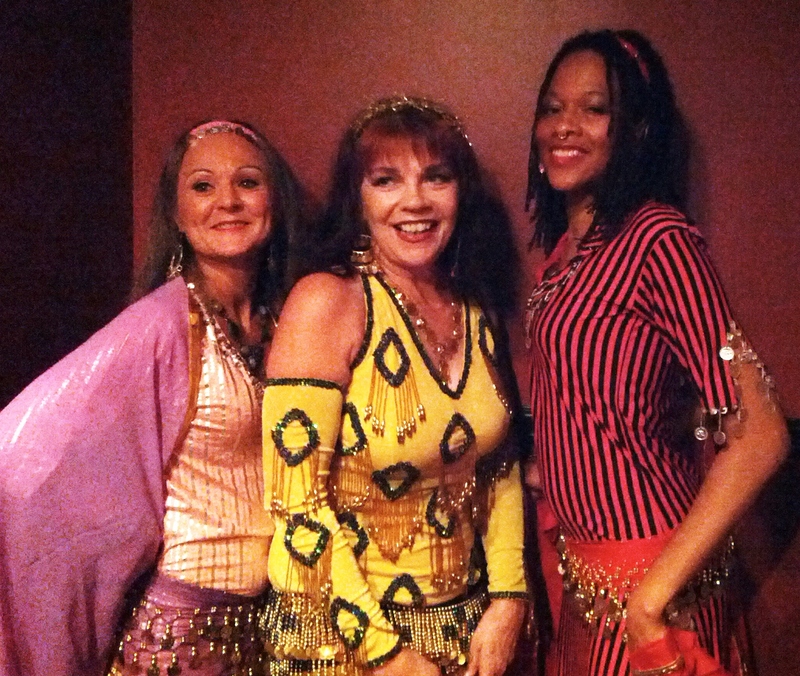 Then we were absolutely thrilled to be invited to “Tummy Tuesday”, a monthly hafla in Richmond. I LOVE Richmond dancers, they’re so friendly! The space was challenging but my dancers did amazingly well, I’m very pleased with their aplomb! We had a great time doing veil again, and of course finger cymbals. Good times! We have a few things coming up right here in town that should be fun too; what a great way to spend a summer – dancing!